I’m new to woodworking, and want to set up my own beginner’s woodshop. I have built one table so far through the California College of Arts and Crafts–and LOVED it. Now I want to start practicing on my own, but I don’t know where to begin. Do I need to have power tools? If so, what should I start with? What hand tools do I need? Any advice is appreciated! Well I was a beginner many years ago and it does take a long time to get to know what you need, I tend to buy anything and every that I fancy. Being serious the main thing is to become proficient in using and sharpening hand tools. The main tools you will need are good quality hand planes ( ideally Lie Nielsen or Clifton) and a good set of chisels ( Lie Nielsen are about the best you can get, although very expensive) and some hand saws. Yes power tools are very important, in order of preference I would suggest, Impact drill driver, Band Saw, Router, Table Saw, then Morticing machine. At the cheaper end of the market you will of course need a variety of tools such as rulers, squares gauges etc. Hi Adam. Unable to decide if you are UK or USA based. Anyway, tools are very much of a muchness, the quality is consistent across continents. Your question is do you need power tools? Well, I'd say not really but some power tools do make repetitious jobs much easier. I'm sure you have some ideas on what tools you need to start with but my suggestions are as follows, firstly what to buy new ? Drill 'index' (a set of twist drills) 1/16" to 3/8" (1.5-10mm). Screwdrivers, 8"'x 5/16", & No 2 Posidrive (or Phillips) (best the very best you can afford to ensure it will last a long time. Honing Guide and Sharpening stone initially 300 or 400 grit. Chisels ? 1/2'', 3/4'' and 1'' - anything from Stanley, Marples or Footprint makes. Jennings pattern 'Bits' (wood twist drills) 3/8", 1/2", 3/4" and 1" initially. 'Workmate' - with a suitable height saw horse and length of kitchen worktop will make a useable bench to start with. Cramps - 'G' (or 'C') clamps, Sash Cramps, a pair of 48" or 50" will start you off. As many Squeezy clamps as you can find/afford. Lastly a new tool - a rechargeable 1/2" drill/driver, you have 3 choices/decisions; battery voltage, and is the battery common across a range of power tools. Once you are used to those tools you should then start to widen your selection. 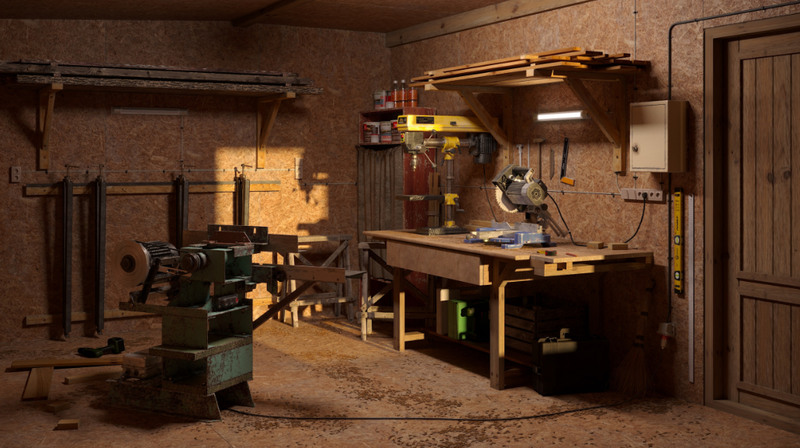 here below how my workshop currently looks, I know it's far from perfect and needs some improvement, I plan to add some shells for tools and add some better light sets - what are you currently using? Before you fill up your wall space it might be a good idea to paint your walls and ceiling white. I have found that this helps with the lighting. Do you have any routertable in your workshop? suggest me a good routertable for my workshop. Please suggest me any portable and cheap routertable.